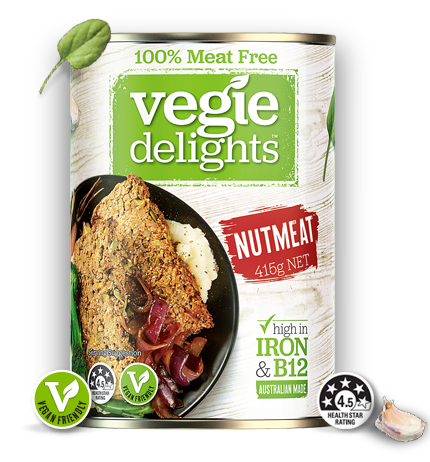 A Vegie Delights classic! Our Nutmeat is made right here in Australia – since 1912. Perfect for casseroles and quick sandwich fillings. Open can on the end without the ring pull using a can opener. Loosen the Nutmeat by running a table knife around the inside of the can between the can body and the Nutmeat. Open the ring pull lid on the opposite end. Made in Australia from at least 87% Australian ingredients. PS. Got a great recipe for this product? Share it for the chance to win a share of $1,000! Terms & Conditions Apply.